US, 1934, 78 minutes, Black and white. Anne Shirley, Tom Brown, O.P. Heggie, Helen Westley, Sara Haden. Anne of Green Gables is the first screen version of the very popular novel by L.M. Montgomery (Lucy Maud Montgomery). 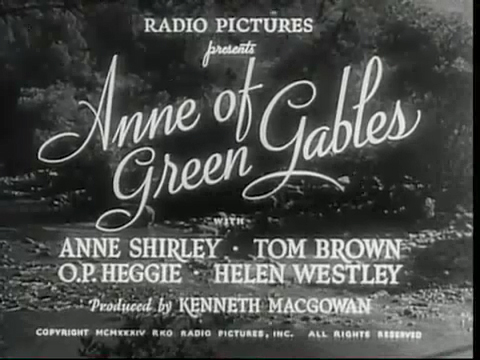 The film stars Anne Shirley who took the name of her character as her stage name at this time. She appeared in the sequel, Anne of Windy Poplars (1940). She also received an Oscar nomination for her role in Stella Dallas. Australian-born O.P. Heggie is very sympathetic as Matthew Cuthbert and Helen Westley, always very strong-minded in her films (Show Boat) is his sister Marilla. Sara Haden who was to appear as Andy Hardy’s aunt in the series is the neighbour, Mrs Barry. The film is set in Prince Edward Island, Canada, and is the story of an orphan who was adopted by a brother and sister who were expecting a boy. Despite Anne’s vigorous imagination, bad temper, non-stop talking, she eventually charms everyone, especially the local schoolboy who initially antagonises her, Gilbert Blythe, whom she will eventually marry. The film is brief, moves over some of the years of Anne’s growing up very, very rapidly. The story was so popular that it was a miniseries in 1985, capturing audiences all over the world. There was a 1987 sequel as well as one in 2000, all starring Megan Follows. Richard Farnsworth and Colleen Dewhurst were the brother and sister. There was another sequel in 2000 and a planned sequel for 2009 with Barbara Hershey as the older Anne, co-starring with Shirley MacLaine?. There have been several animated series including one from Japan. The story is popular, the film shows something of its age but has quite a charm from the strength of the performances and must have given some rivalry to Shirley Temple vehicles at the time. 1.The popularity of the novel, the film and television versions? The nature of the appeal? The character of Anne, the orphan, her strength of character, Marilla and Matthew? 2.The black and white photography, the style of the 1930s? The musical score? 3.The focus on Matthew and Marilla, Matthew being disappointed in love, Marilla and her hard attitude towards life? Their expectations of a boy? The discussions with Mrs Barry? Matthew and his going to the station, discovering a girl? His silence, his good nature, his wisdom? No imagination – nor Marilla having imagination? Their upset at Anne? Taking her back? Marilla, her severity, with the mother with all the children, with the head of the organisation for placing orphans? Her decision to take Anne home? 4.Anne, her age, her parents dying, the orphan, looking after children? Her imagination, her continually talking? Her wishing she had the name Cordelia, different coloured hair, not so thin …? Her imposing herself on Matthew, talking during the journey, renaming the house Green Gables? The confrontation with Marilla? Her outspokenness? Her plea not to be left with the mother and children? 5.Meeting Mrs Barry, Mrs Barry’s comments about thinness and red hair, her losing her temper? Matthew persuading her to apologise, her profound apology? The motivations? Meeting Diana, friends? Going to school, talking non-stop to the teacher? Gilbert Blythe and his comment, her breaking the slate over his head? The reaction of Matthew and Marilla? 6.Her life with the couple, good at housework, clever at school? The years passing? Matthew and Marilla growing fond of her? 7.The relationship with Gilbert Blythe, the hayride, his insulting her? His overhearing her comments? Their gradually talking, her haughty attitude? In the boat, his rescuing her from the tree limb? Her change of heart? Sweetheart, the years passing? The story of Matthew’s frustrated love? Marilla’s severity and banishing him? 8.Anne, growing older, her exams? Doing well? The incident of the amethyst brooch and her making up the story? 9.Her going away to college, her studies, the years passing, no contact with Gilbert? His studying to be a doctor? 10.Diana, her marriage, visiting Anne, telling her about Matthew’s illness, Anne coming home, going to get Gilbert and the doctor? Matthew’s being well cared for? The reconciliation with Gilbert? With Marilla? 11.Popular story, audiences identifying with Anne? Parents with Matthew and Marilla? The continuing popularity with sequels?